The past several years I have done a lot of hiking in the winter to keep my lungs and legs in as close to mountain goat shape as possible for hikes into and, more importantly, out of Joseph Creek . This past winter I have not done as much and my hiking fell off severely as spring came. The spring has been exceptionally busy and my fishing and hiking season has gotten off to a slow and rocky start. Don’t get me wrong, I have had some great trips including packrafting Joseph Creek, finding pictographs on a day hike into Joseph Canyon, and many good rafting runs down the Grande Ronde and day trips on the Wallowa. I knew I was not in as good a shape as I should be to hike Joseph Canyon, but I love exploring down there and decided whatever pain came was worth it. By the end of the regular work week I am usually ready to go hiking and exploring. When Saturday June 16th came, I just felt tired. I laid in bed in the morning trying to decide if I had the energy and was in good enough shape to go to Joseph Creek. I wasn’t sure and I was not making a decision real quick. Rather, I dragged myself out of bed, finally, and drank coffee and thought about easier alternatives to hiking Joseph Canyon. I had wanted to explore the Minam River more, but the water was still too high to wade. A day float on the Wallowa was always fun and it is hard to beat the rainbow fishing between Lower Diamond Lane and our store at Minam. I even contemplated a quick overnight run down the Grande Ronde to fish for some of those big rainbows that lurk in that canyon. But I needed to hike. I was out of shape and it made me a bit mad. I had not taken the time to keep myself in shape for hiking and now that I had a weekend to go somewhere, I felt too tired and out of shape. I ruminated on it for a while over my coffee and finally decided I might as well break myself back in the hard way and head to Joseph Creek. In the summer I usually know exactly where my gear is because I used it just the weekend before. Here I was in the middle of June and I didn’t even know where my pack was. I began searching my bedroom, my office, closets, and the garage for all my gear. I hate looking for stuff. My wife runs the day to day operation of our raft rental business and she was busy taking care of rafts and shuttles down at the Minam Store, but I called her anyway asking in a grumpy voice what she did with all my gear. “Where is my pack? I can’t even find my pack! Where is my two man teepee tent? Shouldn’t it be with the other tents? Did you fix my tent this winter since I tore a loop off it?” I shouldn’t have been grumpy with her. I had tore the loop off my tent and should have fixed it and if I had put my stuff away I would have known where it was, but I was tired and wore out from working on her rafting/gear trailer late into the evening for the past week. She had her gear trailer and now I just wanted my backpacking stuff so I could hike into a place where I didn’t have to answer a phone, nail hardwood floors down, or weld and grind on raft trailers. I eventually found my gear including my tent which I had to sew up and I finally made it to the Warm Springs Trail in the afternoon. I knew I would not have much time to fish. This trip was more about getting out and making my legs and lungs work hard again. Besides, Joseph Canyon always has a whole lot more to offer than just fishing. This was my fourth hike into Joseph Canyon this year on the Warm Springs Trail and I had seen a black bear on two out of the three hikes so I was on the lookout. I was packing a long lens and I hoped that I might get close enough to shoot some good pictures. After finding the Nez Perce pictographs earlier this year, I was also examining a whole lot of rocks on my way down the canyon, hoping to get lucky twice and find another set of pictographs. I followed the trail into the canyon for a while and then began exploring different nooks and crannies and just made my way where I wanted to. I did find one rock that looked as though it might have a faint drawing on it, but I couldn’t say with certainty. The shapes I saw on the rock were the same as I had seen on other pictographs, so I thought it was likely that I was seeing a very old pictograph. As I got near the creek I saw a black bear out of the corner of my eye on the other side of the creek. At first glance it looked like he had a deer by the throat and was trying to hold it down. 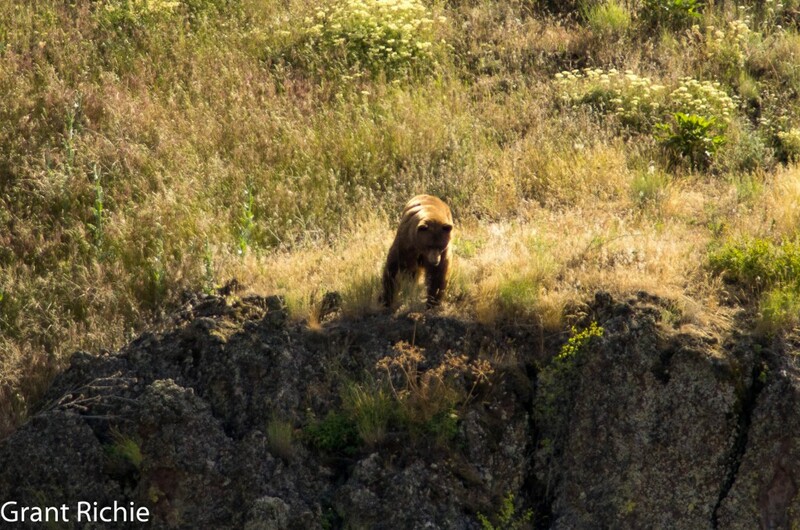 As soon as I saw the bear I dropped down low and slid my pack off so I could get my longer lens out. I called Molly, my border collie, over to me and quietly told her to lie down. As I watched the bear I noticed he was indeed biting something under him occasionally, but it wasn’t a deer. It was a female black bear that was a light tan color, almost the same color as a deer. What the . . . it must be breeding season. I was a little dumbstruck at first but got out my camera and longer lens and quietly took some photographs. I began edging my way closer trying not to draw any attention my way. But the bears were distracted and I finally just stood up and walked over to the bluff overlooking the creek and set up my tripod as close to the bears as I could get. At first I thought it was pretty cool. Wow, I thought, this is pretty rare. I shot many pictures of the bears breeding and then waited for them to do something else. And I waited. And I waited. Geeze guys, isn’t that long enough I thought. After almost an hour of waiting I finally decided I would head down the creek and find somewhere to camp far enough away from the breeding bears. As I walked back to my pack and got ready to head down the canyon, they finally stopped and the female went directly to eating berries on the hillside while the male sat there looking wore out. I took my pack off again and took more pictures and enjoyed watching the two bears do something else for a while. Movement on the ridge above them caught my attention and I looked up to see a larger male bear come out of the draw and begin making his way down to the other two bears. This new bear’s golden brown coat glistened in the sun. He was a beautiful bear in his prime. He strolled down the hill through the tall grass until he came to a rock bluff where he stopped and looked down and listened towards the other two bears. Now the first two bears were both happily grazing on berries and had no idea there was a third larger male just above them. The big brown male slowly made his way down through the rocks towards the other two. Now I was getting excited again. Was I going to see two black bears fight over this female? The big brown male slowly and quietly made his way across the steep hillside and when he began to close in on them the hair on his back stood up and he began to develop a big hump in his back. The big brown male got very close to the other two before they noticed him and when they finally did the smaller black male ran off into the brush upstream while the female headed downstream. The big brown male took his time. He was in no hurry. He began slowly and methodically following the female, stopping to smell her every little bit. The small cinnamon female initially ran when she was startled, but began stopping and waiting for the big brown bear. They slowly made their way off into a draw down the canyon and the male black bear reappeared out of the brush and made his way down into the creek bottom. I may never see something like that again. I spent over two hours watching it all unfold. After the bears were all out of sight I made my way well downstream of them and made camp on a small meadow. I had an uneventful evening and night. It was peaceful, just birds and the creek at my camp, that is, other than the deer that finally came out of the brush after they decided I wasn’t leaving. The next day I began re-exploring the creek bottom and every interesting rock formation I could find. I found no more pictographs. But I had a great time catching lots of smallish rainbows on a big orange stimulator and then switched to a double bunny and olive woolly bugger and searched for smallmouth bass in the slower parts of the pools. The smallmouth like woolly buggers just as well as every other fish it seems, although I was a bit surprised that I caught more rainbows on the double bunny than smallmouth. After exploring a few miles downstream I decided it was time to head back to camp and start my grueling hike out. The Warm Springs Trail is pretty good on the upper end but the bottom end is steeper and the very bottom of the trail just disappears. Not knowing where the trail is at the bottom, I simply started up the canyon taking a new route. I took my time and didn’t push myself since I was out of shape. It actually felt pretty good. The first 1500 feet in elevation gain didn’t feel bad at all. After that, my legs and feet began to tire. Somewhere between feeling pretty good and getting pretty tired, I looked over to my left and saw what looked like the same tan colored black bear from the day before. She was very close and didn’t see me so I dropped down into the grass to get my longer lens on again and quietly called Molly over to me. I slowly eased up with my long lens, but she wasn’t there. I began scanning the canyon wall for her and saw her moving. Her path was going to cross my ridge up above me. I took some pictures and then began trying to push myself up the canyon fast whenever she was out of sight. She occasionally stopped and looked back down the canyon like something was after her. After I was sure I lost sight of her for good, I took a breather and began scanning the draw below me to see if there was another bear coming up behind me, following the female. Indeed there was another black bear some distance away. I grabbed my camera and pushed the shutter button down just as he disappeared around a rock bluff. I missed him but another black bear appeared slightly higher up the draw closer to me. 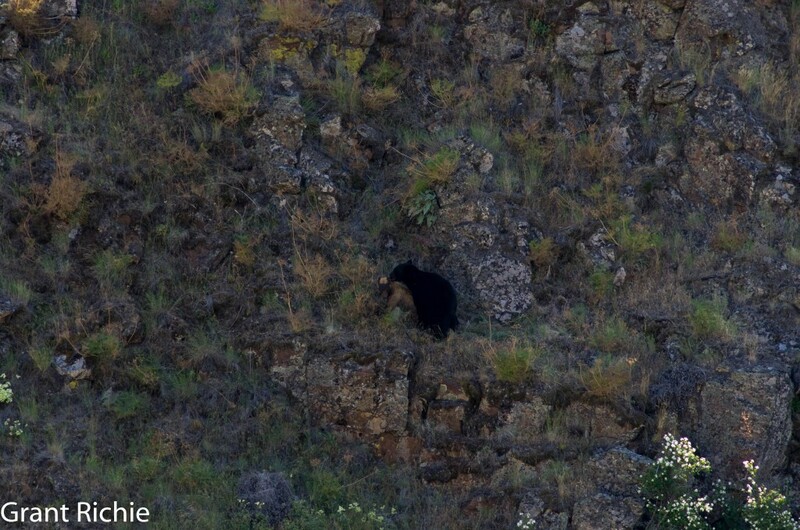 This black bear began on a diagonal path up the canyon towards me and the female. This was the sixth bear sighting in 24 hours. Granted two of the black bears may have been the same and the small female looked to be the same one from the day before, but that still made for four individual bears in about a 1 mile radius. I watched the last black bear for a while as he came closer and closer. He eventually went into some thick brush and after 10 minutes of watching he didn’t come out. I decided it was time for me to move on. The rest of the hike was uneventful. My body became more and more tired and I began concentrating real hard on simply putting one foot in front of the other until I was finally to my car. I was wore out. I began driving home and stopped in Enterprise at the Subway to get a sandwich. When I tried to get out, I could hardly walk though. My legs and feet were stiff. It was good pain though. I was getting back in shape and had one of a kind scenery in the process. Click the picture below to see more pictures from this weekend.